Often, we happily eat something for years without stopping to fully appreciate its goodness. 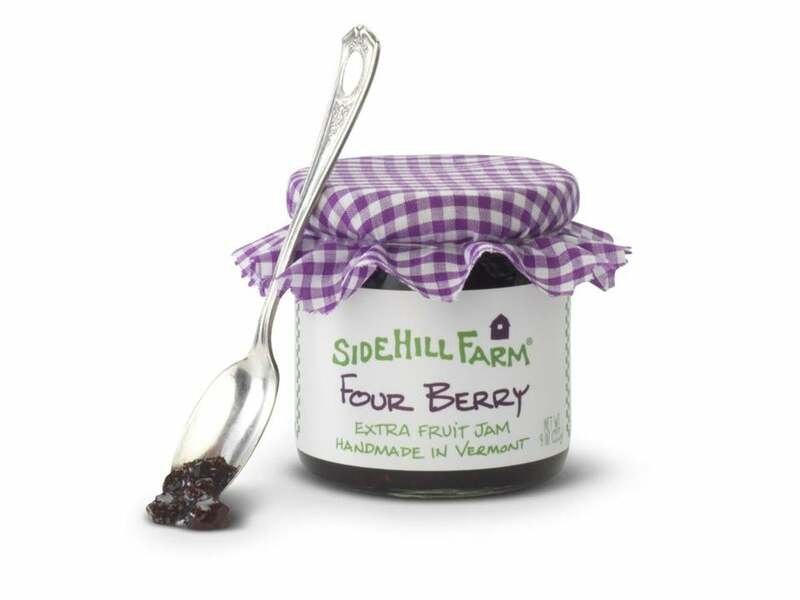 So it was high time (for me) to take a fresh look at Sidehill Farm jam. The little jars with quaint fabric tops, in flavors such as Wild Blueberry, Red Raspberry, Strawberry Rhubarb, and Apricot Orange Marmalade, are produced by a family-owned Vermont company that has made jam the old-fashioned way for over 40 years. Just fruit and sugar. No pectin or preservatives. In fact, the makers rightly call it “Extra Fruit Jam” because there’s more fruit than sugar; the rich, pure flavor evolves from long, slow simmering. “It tastes how jam is supposed to be made,” says Kristina Naylor, who owns the company with her husband, Kelt Naylor. Kelt’s parents, Dot and Ben Naylor, started the business, making peaching jam, in 1976, and in 2000, Kelt and Kristina took over. They expanded the business, moved production to a larger facility in Brattleboro, and pursued their goal of using more local fruits, says Kelt. “We mostly work with farms in New England and New York state,” he says. The couple makes about 35 different products, including jams ($7 for 9 ounces), marmalades, fruit butters and pastes, and a tantalizing topping called Vermont Maple Apple Drizzle. The fabric tops are “our signature look,” says Kristina, explaining that it harkens back to a time when great-grandmothers made jam this way. (The fabric kept dust off the tops of jars stored in musty cellars.) Sometimes the good ol’ days were just that . . . or at least the jam was.